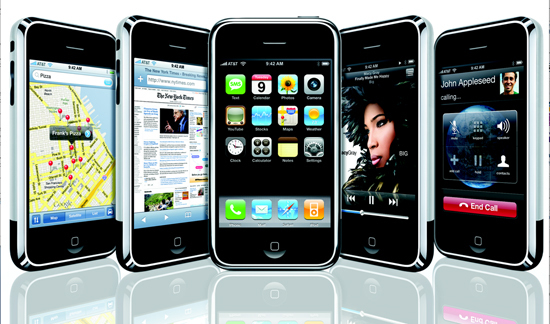 Since its release, the Apple iPhone has been “the” gadget to own for 2007. It allows its user to make a call by simply tapping a name or number in the address book, a favorite list, or a call log. It also automatically synchronizes all your contacts from a Windows PC, Mac, or Internet service. The iPhone also lets you select and listen to voicemail messages in whatever order you want. If that is not enough, Apple recently launched its 8GB version of the hottest mobile phone on earth. In plain sight, it looks similar to its predecessor, but it now has support for features that were missing in the original model such as access to AT&T’s 3G HSDPA network, letting you buy from iTunes wirelessly, allowing you to create Microsoft Office documents, and an iChat for video telephony. The newer model also features an expanded built-in memory, an external high-capacity memory card slot and a consumer-swappable battery. And like the first-generation model, the Apple iPhone 8GB has a stunning display, a sleek slim design, and an innovative multitouch user interface. Its Safari browser makes for superb Web surfing experience, and it offers easy-to-use applications. It can also function as an iPod. However, the Apple iPhone has variable call quality and lacks some basic features found in many mobile phones such as Bluetooth support and 3G compatibility. Its integrated memory is meager for an iPod, and you have to sync the iPhone to manage music content. Despite its flaws, and the perception that this model is a better version of the first-gen iPhone, the Apple iPhone 8GB sets a new benchmark for an integrated cell phone and MP3 player.